Straddling Lord of the Rings fantasy and superhero action in London, comes Thor: The Dark World. Chris Hemsworth returns as the Prince of Asgard, Thor. This time, new villain Malekith (Christopher Eccleston) destroys much of Asgard intent on controlling the “Ether” – an ancient power that has become entwined within Jane Foster (Natalie Portman). 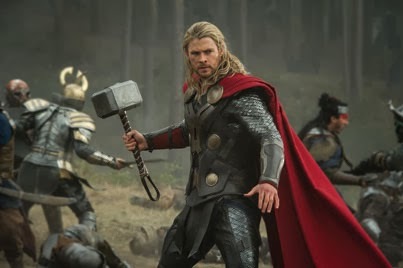 Thor and his merry band of Asgardian friends – including Avengers Assemble’s Loki (Tom Hiddleston) – are forced to protect Jane while ensuring that Asgard (and Greenwich in London) itself remains unharmed. More complicated than its predecessor, this sequel clashes horned-helmets and mystical forces with gusto, balancing Shakespearian language with a comedic sense of self-awareness. What a relief to see such a stylised form of story-telling opposed to the well-worn hero-in-city style of Spider-Man and Iron-Man. Inevitably, the formulaic shine of Marvel means it lacks risks and plays it safe, but it’s nevertheless a strong entry into the series.